The Indirect Restorations module covers restorations that are made outside the mouth (for example by a dental laboratory), like Crowns and Bridges. Learn how to create amazing preparations for indirect restorations. I found it extremely interesting and well-presented/explained all the topics included in this module. The Indirect Restorations online learning module has clear and concise aims, objectives and anticipated outcomes, listed below. These will appear on the Dentaljuce Enhanced CPD Certificate, along with the time spent, dates, and detailed topics you studied within the module. Certificates can be printed at any time, covering any range of dates. Dentaljuce CPD complies with the UK GDC's requirements for enhanced verifiable continuing professional development. Improve my skills with, and understanding of Indirect Restorations. Take the Dentaljuce Indirect Restorations module. 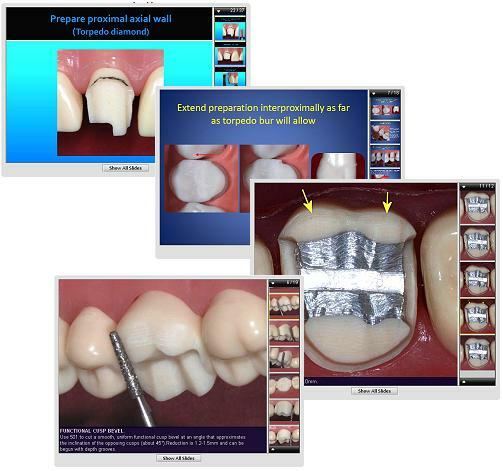 • Through extensive and detailed step-by-step guides, learn the wide and varied application of individual indirect restorative techniques using laboratory fabricated restorations. • Learn the indications for operatively treating the dentition with indirect restorations. Improve my skills with, and understanding of Indirect Restorations. Take the Dentaljuce Indirect Restorations module. • Through extensive and detailed step-by-step guides, learn the wide and varied application of individual indirect restorative techniques using laboratory fabricated restorations. The aim of the learning and teaching materials in this Dentaljuce module is to allow learners to develop their professional knowledge, understanding and competence in the field of indirect restorations, in line with their identified personal learning requirements. • to demonstrate the wide variety of restorations that can be undertaken using modern indirect techniques. • appreciate and apply the minimal intervention philosophy regarding the managemement of the carious, worn, or traumatised dentition.